iZotope’s update to Nectar adds AI learning and a raft of new features, but is it food from the gods, or a dish best served cold? iZotope has updated its Nectar vocal-production suite to version 3, with a tasty new GUI and intelligent mixing features that bring it in line with Neutron and Ozone. On the surface, many of the modules remain the same and include two compressors with four algorithms; two EQs; a de-esser; a gate; a stereo delay with five saturation modes; a Dimension module (chorus, phaser and flanger effects); real-time pitch correction; a Harmony module; a smooth plate reverb; and a limiter. Phew! If you dig a little deeper, though, it’s clear to see that this is a substantial new release with some impressive tricks up its sleeve. As expected, Nectar 3 includes iZotope’s AI learning technology, this time in the form of Vocal Assistant. After selecting from Vintage, Modern or Dialogue modes, and whether you want Light, Moderate or Aggressive intensity, the plug-in listens to your audio and spits out a custom-made preset including character EQ, level balancing, compression, subtractive EQ, de-essing and pitch correction (if required); and finally reverb. As with Neutron and Ozone, this is just a starting point, and you’ll want to make adjustments to taste, but the results are pretty decent. In particular, the overall Character EQ and Dynamics control helps lift the top end of the vocal in an effective and tasteful manner. One of the issues we had when using Neutron’s Assistant on multiple tracks was that it made everything too bright. So in some respects, this is a better use of the AI Assistant, as nine times out of 10, the vocal will want to be the most prominent track in the mix. But wait! The Assistant isn’t finished… There’s also an Unmask feature that can be run in parallel to the Assist function. For this, you’ll need to place a second instance of Nectar 3 (or of Neutron or Relay) on another track that may have clashing frequency content. This could be a piano or guitar part, or perhaps a whole buss that contains all of your midrange instruments. The two plug-ins will then talk to each other and if masking is detected, a static EQ curve will be applied to the second plug-in. Unfortunately, you can’t edit this EQ curve, though, or even control the amount. That aside, it’s a very simple process and surprisingly effective at providing some space around your lead vocal. Visually, Nectar has had a complete overhaul to help it sit alongside iZotope’s other offerings. 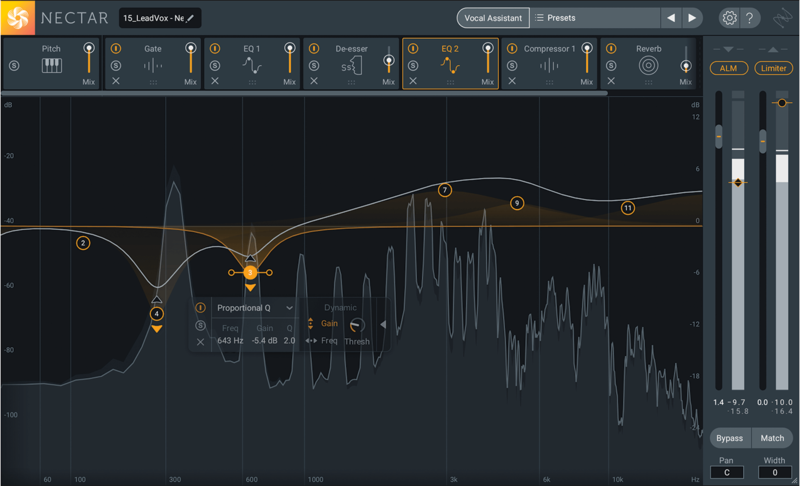 The GUI makes much better use of space, with controls overlaid on the large waveform or spectrum graphs, rather than having unused, empty blocks, as was the case with Nectar 2. While this is a nice addition for modules like the Saturation and Delay, it’s a complete revelation for the EQ, Compressor and Gate, making them much easier to use for dialling in precise settings. The silky smooth movement of the spectrum and scrolling waveform displays is a noticeable step up in quality, even from iZotope’s recent releases. Our only minor gripe is that where Neutron and Ozone offer the ability to fine-tune the metering, Nectar’s settings are almost non-existent. This isn’t a major issue, but it can be useful to set the spectrum time to Infinite so that you can carefully hone in on certain frequencies, and that isn’t possible here. One of the best new updates is the highly versatile EQ module, now with up to 24 bands, 16 shapes, band solo, and Dynamic Gain and Dynamic Frequency modes. We’ve seen the Dynamic EQ in both Neutron and Ozone before, and it can be very useful for transparently taming wayward peaks while leaving the quieter parts untouched. The Frequency mode, though, is something new that allows you to create a boost or cut and have it track the pitch of the nearest moving harmonic peak. 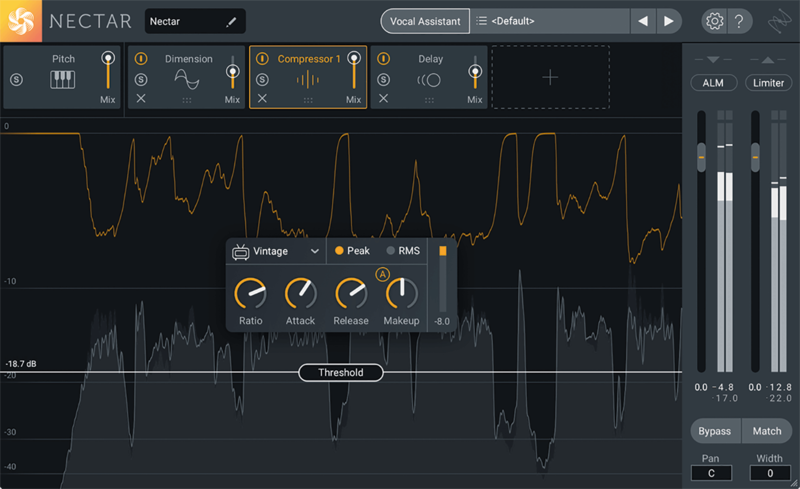 Although it doesn’t offer the finer levels of control available in Sound Radix’s pitch-tracking SurferEQ, this is an incredibly useful feature to help craft a consistent vocal sound, without the need for automation. Just be aware that it’s optimised for vocals, and didn’t really work when we tried it on a low synth bassline. Another extra is the RX7 Breath Control plug-in, which is essentially the same as Nectar 2’s Breath Control. This enables you to set a gain reduction amount or target volume for the breath sounds, which is a great timesaver. However, it’s a bit of a pain that it can’t actually be inserted in the Nectar channel strip. This means that if you place it ahead of Nectar, then you run the risk of any compression or processing changing the volume of the breaths; or if you place it afterwards, it won’t be processed by the reverb or any other characterful effects. In practice, we found the best results came from placing it ahead of Nectar 3, then adjusting the breath reduction amount while bearing in mind the subsequent compression. There are a bunch of useful other additions, including two new Saturation modes for the Delay; two new modes for the Saturation Module; additional voices for the Harmony module, taking the total up to eight; a new Close Threshold for the Gate; stereo-width control; and Automatic Volume Compensation for the Bypass button. There’s also a new Auto Level mode similar to Waves’ Vocal Rider, which lets you set a target volume, and rides the output +/- 3dB to keep it near that level. The final piece of the puzzle is pitch editing, and this time around, iZotope has ditched the Nectar 2 Pitch Editor plug-in in favour of partnering up with Celemony and offering Melodyne Essential, worth €99, for free. 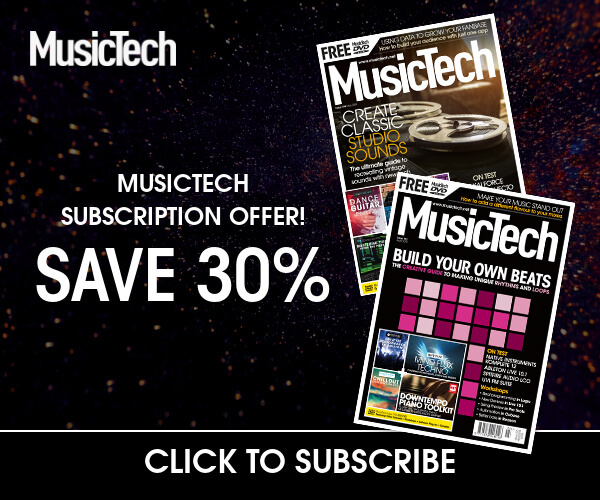 This is a good move, as it means iZotope can focus on what it does best – creating cutting-edge processing – while still offering high-quality pitch manipulation from easily one of the best companies in the business. The only thing I’d point out as a downside is that Melodyne Essential lacks the more advanced and incredibly useful pitch-editing tools that allow you to tweak the pitch drift and vibrato of a performance. To be fair, though, it’s still an extremely useful and great-sounding tool for broader pitch-correction tasks and gets you on the Melodyne ladder, with an upgrade to the Melodyne Assistant costing €149. 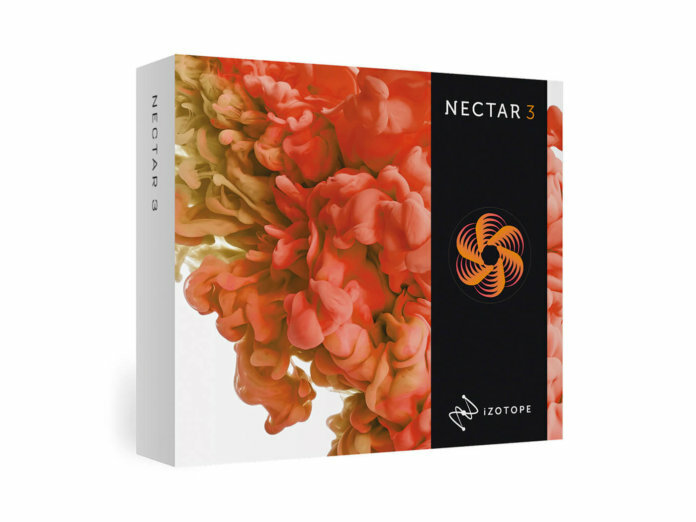 Nectar 3 is packed with multiple modules and features that could fetch twice the price if sold separately. The Vocal Assistant, Unmask and ALM features help to guide your mix decisions, without stripping you of control and the newly designed graphical feedback makes it easier to understand and fine-tune your settings. If you regularly work with vocals and want a one-stop solution to getting a pro sound, then Nectar 3 could be your dream plug-in. Plus, it’s grey and orange, which is a very visually pleasing combination! It’s possible you may have some plug-ins that can achieve the same results as Nectar’s modules, such as noise gates, various compressors, a limiter, a de-esser, chorus and reverb. However, having them all housed in one wrapper helps to refine your workflow and keep your track inserts tidy. There are also a whole bunch of other features and effects here that are a bit more unusual and advanced, such as the Breath Control plug-in, the AI assistant, the ALM volume balancing, the pitch-tracking EQ and the MIDI controlled harmony module. If you already own Melodyne, Surfer EQ and a load of Waves plug-ins that do these things, then Nectar may not be so useful, but to anyone else, it’s a superb way to get all of these functions in one fell swoop. 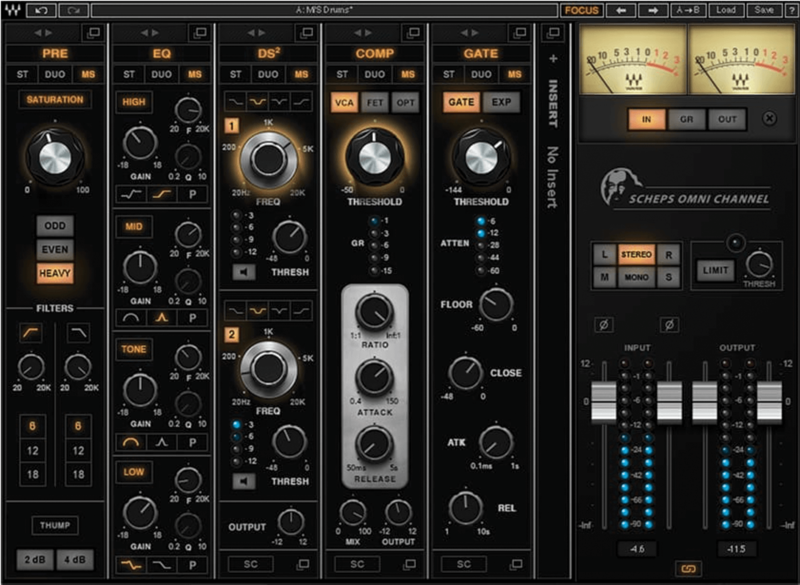 Designed with Grammy-winning mixer Andrew Scheps, this flexible channel-strip plug-in lacks the visual feedback and some of Nectar 3’s flashier features, butdoes have a tried-and-tested collection of vintage-sounding processors and includes a pre module, EQ, compression, gating, de-essing and more. 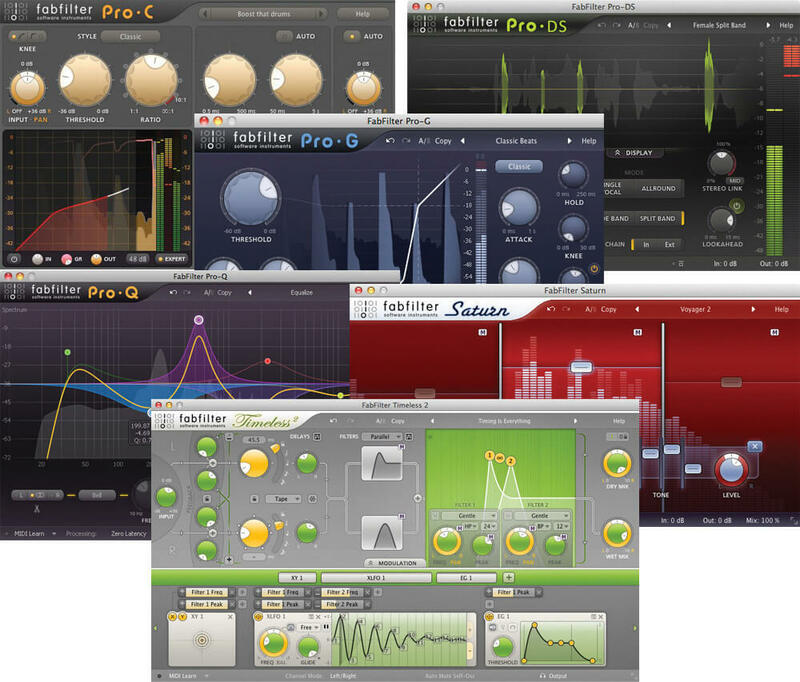 It’s hard to find an alternative with the same massive feature list, but this Mixing Bundle from FabFilter comes pretty close, as it includes so much. You get Pro-Q 3, Pro-C 2, Pro-DS, Pro-G, Pro-R, Saturn and Timeless 2. With them, you also get some excellent GUIs and more depth and flexibility, but without the vocal-focused workflow of Nectar. An easy-to-use, expertly crafted vocal plug-in that’s packed with useful features and refined visual feedback.